"Unique design, delicious sensations, comfortable handle, comes with a padded storage bag." 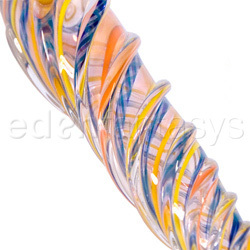 — Epiphora , verified review "Twisted lattachino love wand - glass wands:Swirls are swirls, no matter how small"
An inside-out shaft with multiple solid colors and Lattachino wound around the inside of the shaft. The outside of the shaft has clear "ridge like" wrapping from the tip to the handle that provides a "screw like" textured effect. 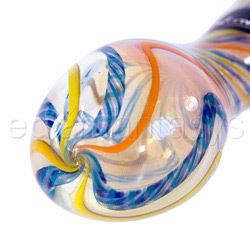 The shaft is tapered from the tip to the handle, which fits comfortably in your hand and makes this piece very functional. Measuring 7" in length and a diameter tapering from 3/4" at the tip to 1 1/2" at the widest point just below the handle. 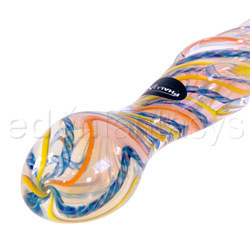 The handle is smooth and rounded nicely to fit in comfortably your palm making it easy to maneuver and control. 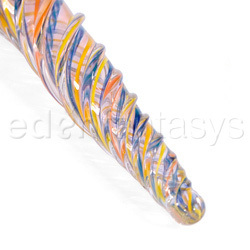 Thank you for viewing Twisted lattachino love wand page!